As much as i love losing hours reading blogs and exploring the web, i'm a complete technophobe when it comes to reading books and magazines online. I much prefer getting my hands on a good book (i'm currently reading The Goldfinch by Donna Tartt) and sitting reading magazines at the weekends over a cup of coffee. 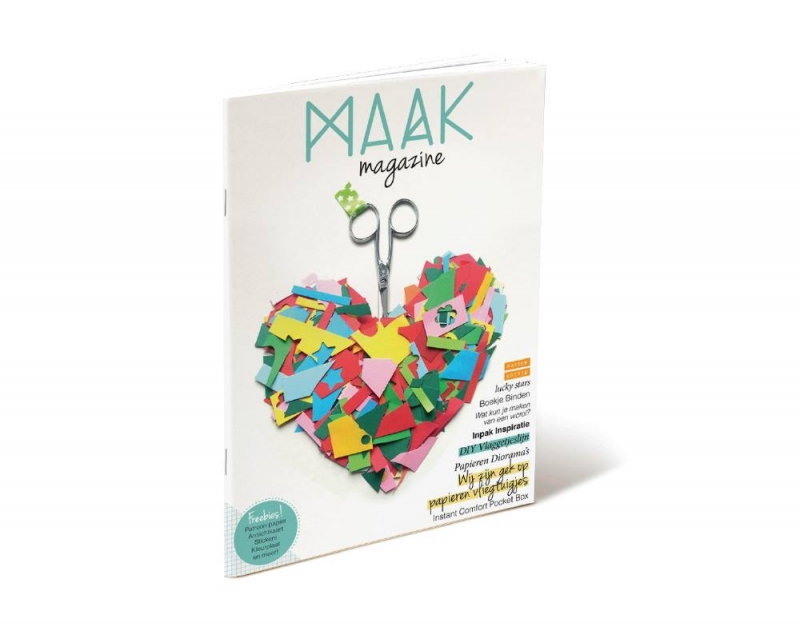 One magazine i've been enjoying browsing recently is a rather lovely Dutch creative magazine called Maak Magazine, which i'd like to review for you today. It's a quarterly magazine with a different creative theme for each edition - #1 Paper, #2 Felt and #3 Beads. Whilst MAAK is only available in Dutch, this hasn't stopped me enjoying the Paper edition of the magazine featuring DIY tutorials, papery inspiration, beautiful imagery and of course a whole bunch of exciting, fun freebies upon arrival! If you're fortunate enough to speak Dutch, there are also lots of interviews and columnists from other paper addicts too. Now i love any parcel that arrives beautifully wrapped and from the moment this metallic envelope came through my letter box i knew this was going to be something good! I really love the 'there's always room for cake' notecard and they've all got such lovely designs on the back of the postcard too - really shows attention to detail don't you think? It really is a beautiful magazine and whilst at the moment, i'm just admiring the pictures and following the photo tutorials it's inspired me to learn a little Dutch so i can make the most of their future issues!